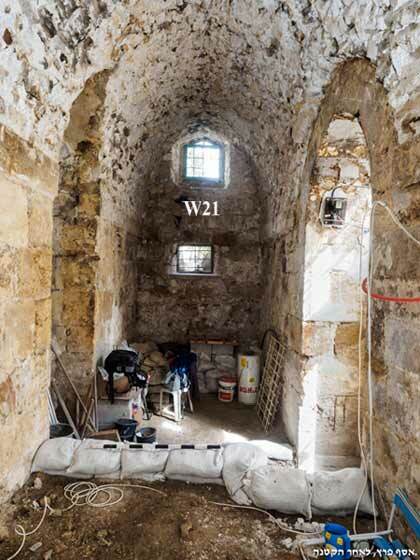 In February 2016, a salvage excavation was conducted at the Church of St. Nicholas in the Old City of Jerusalem (Permit No. A-7601; map ref. 221674–92/631762–73; Fig. 1), prior to development work. 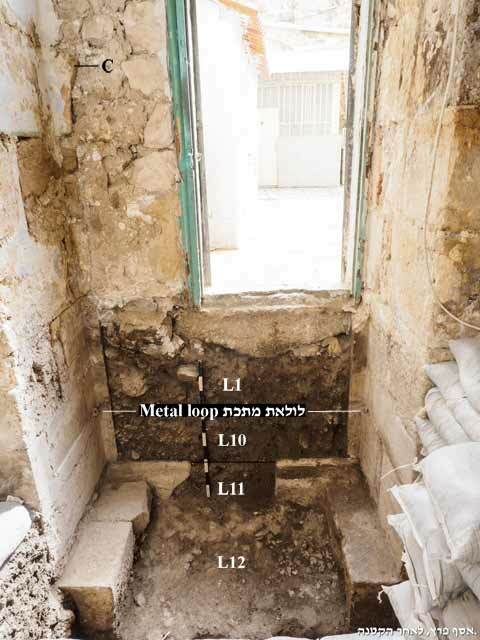 The excavation, undertaken on behalf of the Israel Antiquities Authority and financed by Mr. Gerhard Widmer, was directed by D. Yeger, with the assistance of N. Nehama (administration), V. Essman and Y. Shmidov (surveying), A. Peretz (field photography), D. Tanami (metal detection), H. Makhlin and E. Stern (pottery reading), I. Lidsky-Reznikov (pottery drawing), T. Winter (glass), C. Hersch (glass drawing), A. Ganor (glass restoration), R. Kool (numismatics), I. Reznitsky and V. Nosikovsky (metal laboratory), C. Amit (studio photography), N. Zak (plans) and N. Sapir (Jerusalem Old City district archaeologist). Special thanks go to Dr. Gil Fishhof of Tel Aviv University for his valuable advice. St. Nicholas of Myra is one of the most popular saints in Orthodox and Catholic Christianity. He began his religious calling as a hermit monk, becoming the patron saint of sailors, captives and merchants in later generations. According to his biography, he visited Jerusalem in the fourth century CE, although it is possible that this may refer to another person called Nicholas (English 2012:80–84). According to tradition, he lived in seclusion in a cave at Beit Jala, where a church bearing his name was later built (Abel 1923:261–272, Pl. VI). The church where the excavation was conducted is currently owned by the Greek Orthodox Church, and its structure incorporates Crusader architecture. In a document dated sometime after 1185 CE, it is recorded as one of the Greek churches lying west of the Church of the Holy Sepulcher. In 1189, Saladin granted the Georgian community possession of the church, and it remained in their hands throughout the Mamluk period (thirteenth–fifteenth centuries CE). 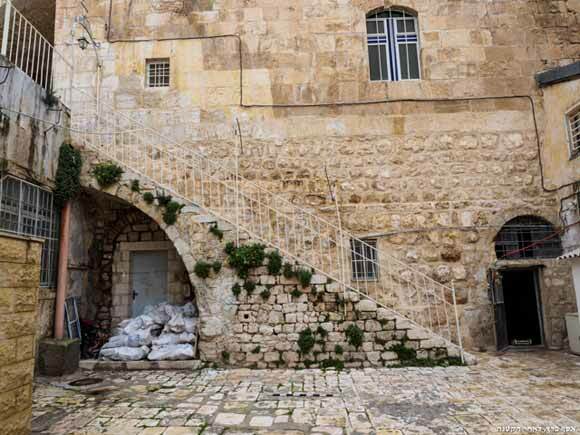 It may be the monastery mentioned by the Russian deacon Zozimos during his visit to Jerusalem in 1419–1421 CE. After the Ottoman conquest, the church was returned to the Greek Orthodox Church, although Georgian monks probably continued to occupy the building (for the church and its historical sources, see Pringle 2007:338–341). Today, the building has two floors. The church is on the upper floor and is square in plan (each side is 19 m long; Fig. 2). Only the east and south walls exhibit typical Crusader masonry, characterized by diagonally dressed stones and masonry marks (Fig. 2, marked in pink). The other parts of the church were rebuilt at a later date, probably following the Ottoman conquest (fifteenth century CE; Fig. 2, marked in blue). The lower floor contains three parallel halls arranged on an east–west axis (Halls 1–3). The halls have barrel vaults with pointed-arched profiles, and they open to their west onto a north–south hall (Hall 4). Openings are set in the shared walls between the three halls. At present, it is not possible to draft a full plan of the lower floor, and the plan presented here is based on a written description of the ground floor (Pringle 2007:339–340). To the south of the Church of St. Nicholas is an open courtyard surrounded by arcades (a cloister), where a few pillars and arches have been documented (W33–W38; Fig. 2); they are dated to no earlier than the twelfth century CE and no later than the fifteenth century CE (Pringle 2007:34). The current excavation comprises two squares inside Hall 1, the southern hall on the lower floor. 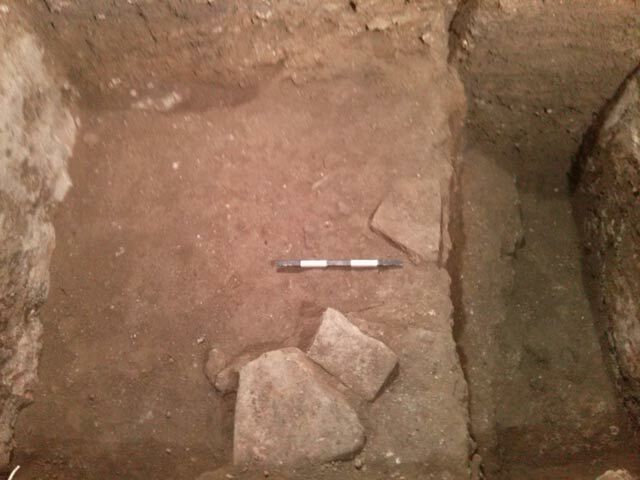 One excavation square (1.7 × 2.5 m) was opened on the west side of the hall, and the other square (1.2 × 1.7 m; Figs. 2, 3) was opened at its southern entrance. Five archaeological strata were identified (V–I). Stratum V (Byzantine period; fourth–seventh centuries CE; Figs. 3; 4: Section 3–3; 5). Three phases were attributed to this stratum. In the first phase, a wall (W24; exposed length 1.7 m, width 0.5 m) was founded on a layer of dark brown terra-rossa soil (L28). Only the foundation course of the wall was preserved—a row of large, dressed stones interspersed with small fieldstones bonded together with light gray mortar containing white inclusions. Remains of a plain white mosaic floor (L22; Fig. 6) with a bedding of yellowish crushed chalk (L31) laid over the terra-rossa layer (L28) were found to the south of the wall. The layer of terra-rossa yielded pottery dated to the second–seventh centuries CE, including a basin with a ridged rim (Fig. 7:1) from the second–fourth centuries CE and an FBW bowl from the fourth–seventh centuries CE (not drawn). The architectural remains therefore date from no earlier than the fourth century CE. 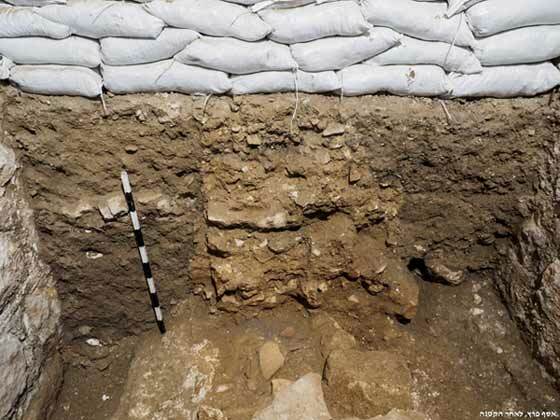 In the second phase, the masonry remains were plundered; the robber trench of W24 (L26) was dug down to the wall’s foundations and cut into the mosaic floor to its south, which was further damaged by the foundation trench of a Stratum II wall (W15; below). 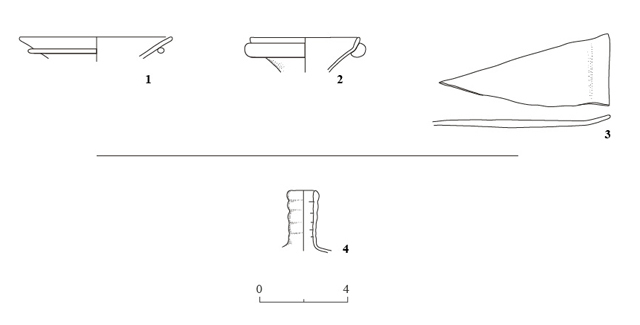 Robber Trench 26 yielded a fragment of a glass bottle or jug with a spout-like mouth, decorated with a wound trail (Fig. 8:1); it is dated to the Late Roman and early Byzantine periods. It also yielded an ornamented bone (Fig. 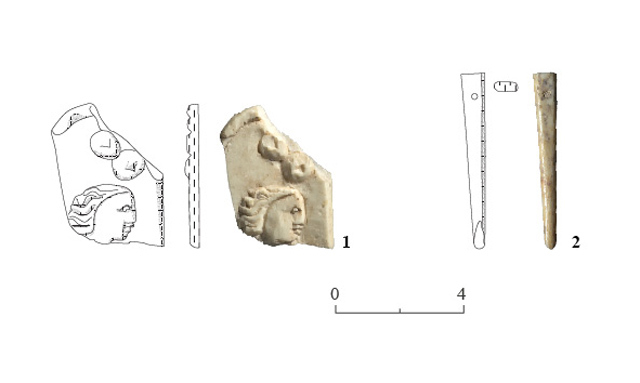 9:1)—part of an inlay in some artifact—depicting the head of a woman in profile with two circles above it, possibly representing stars, and a fastening pin (Fig. 9:2). 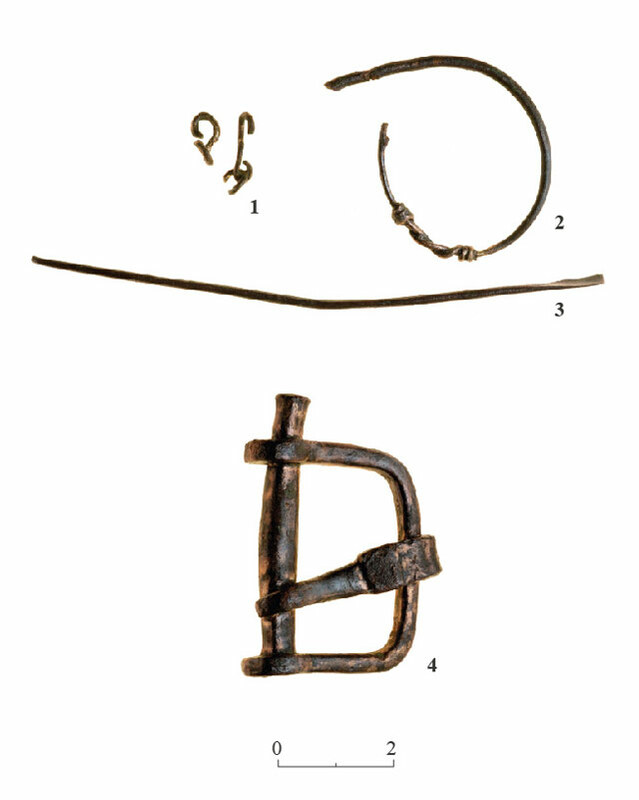 Metal items found in this locus include a chain links (Fig. 10:1), a wound bracelet (Fig. 10:2) and a scapula (Fig. 10:3). A fill of fieldstones (L9; Fig. 11) that sealed the remains from the first phase is attributed to the third phase. The fill contained pottery dating from the Byzantine period, including a basin and a jug (Fig. 7:2, 3). It also yielded a glass bottle or jug with a spout-like mouth decorated with a wound trail (Fig. 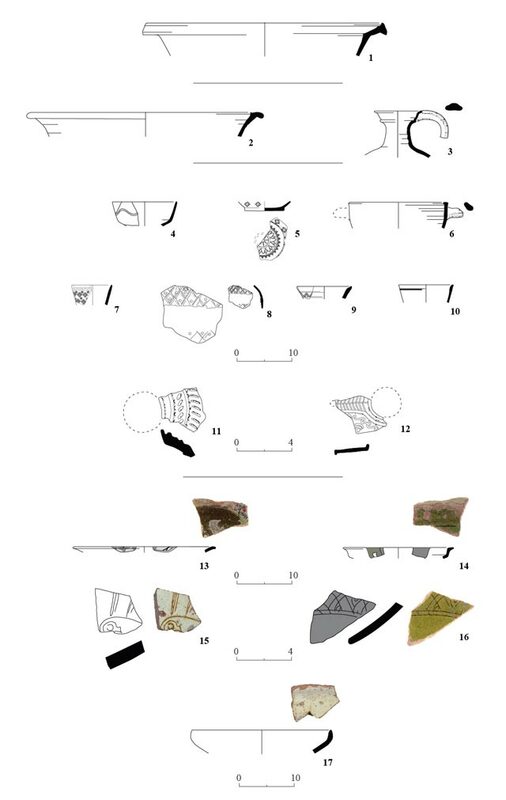 8:2), a vessel that is typical of the Late Roman and early Byzantine periods and a fragment of a window pane with a curved edge in a typical Byzantine style was also found (Fig. 8:3). Stratum IV (Early Islamic period; seventh–eleventh centuries CE; Figs. 3; 4: Section 3–3; 5). Overlaying the stone fill of the earlier stratum was a layer of reddish brown soil (L2, L14), which accumulated during the Umayyad period. It yielded an Umayyad coin minted in Damascus after the reform of ‘Abd al-Malik (697–750 CE; IAA 161142) and a metal buckle (Fig. 10:4). 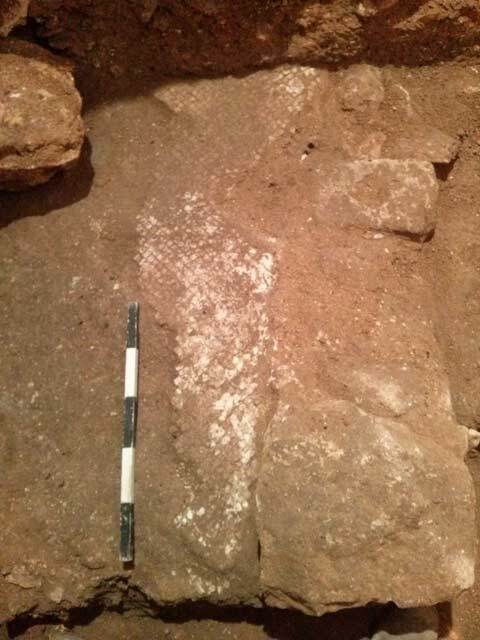 The date of this stratum is unclear, but since the fill was found between the Byzantine and the Crusader strata, it can be attributed with caution to the Early Islamic period. 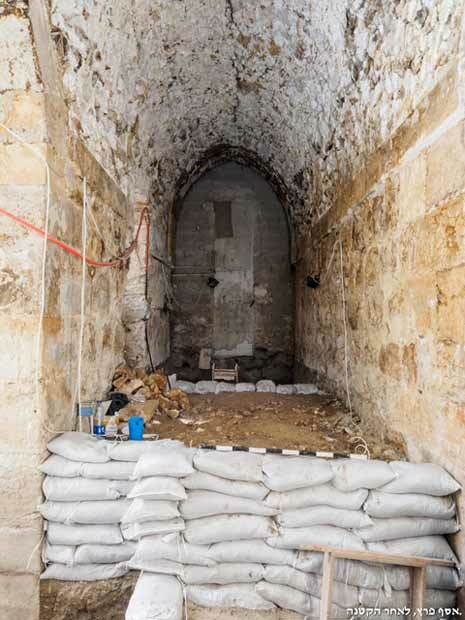 A large quantity of pottery from the Umayyad and Abbasid periods (eighth–tenth centuries CE) was recovered from the foundation trenches of the Crusader church (Stratum III, below). It included an FBW bowl (Fig. 7:4), dating from the seventh–eighth centuries CE; the base of an Abbasid bowl decorated with a mold-made design (Fig. 7:5); an Umayyad casserole (Fig. 7:6); Abbasid jugs with mold-made designs (Fig. 7:7, 8); two buff-ware jugs from the ninth–tenth centuries CE, one of which is mold-made (Fig. 7:9, 10); an Umayyad oil lamp (Fig. 7:11); and an Abbasid oil lamp from the ninth–tenth centuries CE (Fig. 7:12). The glass finds are characteristic of the Abbasid period, and include a bottle whose neck is decorated with horizontal ridges (Fig. 8:4). Stratum III (Crusader period; twelfth century CE; Figs. 2–4). The construction of the original church complex can be attributed to this stratum. The southern hall on the lower floor (Hall 1), where the excavation was conducted, is rectangular in plan (exposed length 12 m, width 2.5 m, height 5.5 m) and is blocked at its east and west ends by later architectural additions (W16, W21); the original length of the hall is unknown. As noted above, the hall is roofed with a pointed-arched vault constructed with an infilling of stones bonded together with pale gray mortar containing black-and-white gravel and inclusions (Fig. 12). The vault rests on two supporting walls (W15, W17) constructed of nine courses and reaching a height of 3.5 m above the original, Crusader-period floor (L6; Fig. 4: Sections 1–1, 2–2). The courses of the walls were built of medium-sized stones squared by rough dressing and bonded together with dark gray mortar mixed with black-and-white inclusions. At the top of the supporting walls is an ashlars-built impost, from which the vault springs. 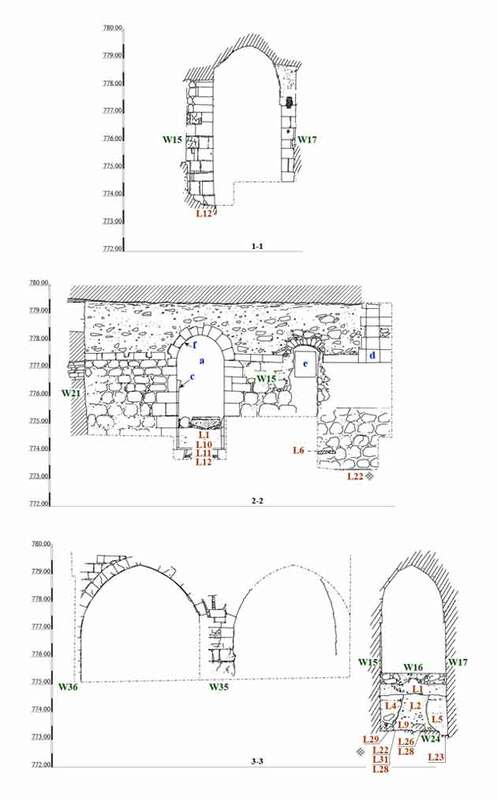 Wall 15 contains an arched entrance (a) that opens onto the cloister courtyard; a pointed-arched opening (b) set opposite it in W17 is blocked with a modern brick wall (W19; Fig. 13), behind which the present Greek Patriarchate Museum is located. 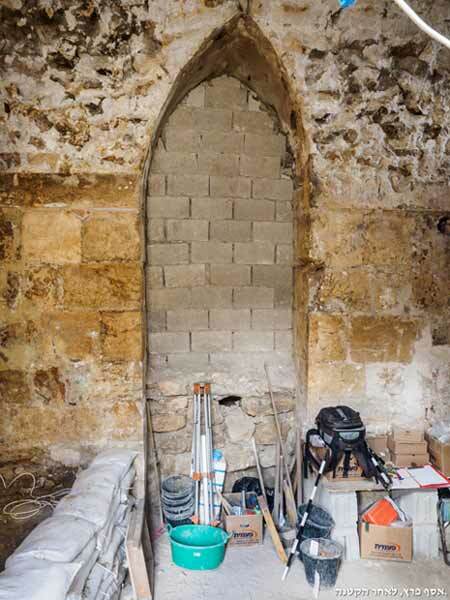 The architectural elements—the jambs and arches of the openings—are meticulously built of neatly dressed stones exhibiting clear diagonal dressing and masonry marks typical of the Crusader period (Fig. 14:1–5). Opening ‘a’ is typical of the Byzantine period: an arch containing a smaller arched structure that served as a stopper for a two-winged door. The upper part of Opening ‘a’ was damaged in a later period, but was repaired with the construction of a later arch (f; Fig. 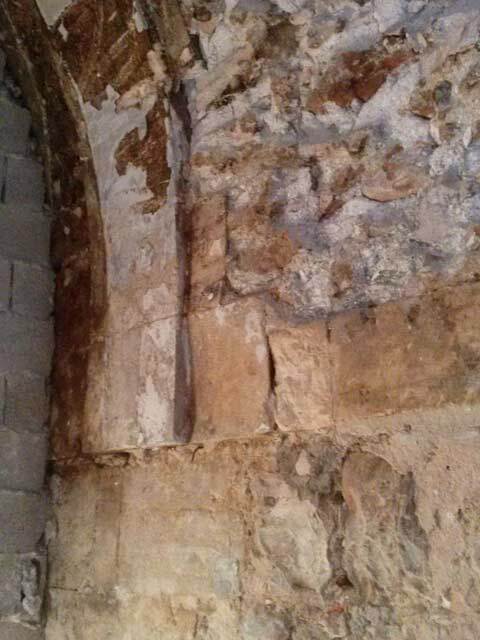 4: Section 2–2); nevertheless, one can deduce the original shape and height of the opening on the basis of a stone in the wall (c) that marks the springing point of the former Crusader-period arch. A frame designed fit for a door is retained in Opening ‘a’ (Fig. 4: Section 2–2). Metal loops inserted in the lower part of both door jambs were probably part of its closing mechanism (Fig. 15). A transverse supporting arch (d) was uncovered springing from the supporting walls on the west side of the hall, attesting to a link with the bay located to its west (Figs. 4: Section 2–2; 16). 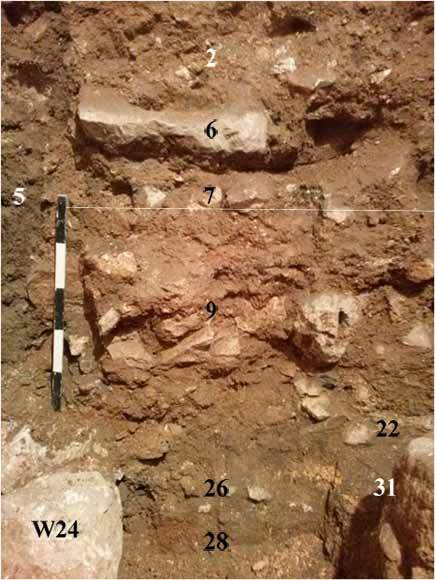 The excavation unearthed the foundation trenches of Walls 15 and 17 (L4, L5, L13), which cut into Strata I and II (Fig. 17). The foundations are made of hard, gray mortar interspersed with small fieldstones (L12, L23, L29). The latest pottery from these trenches dates from the Fatimid and early Crusader periods (eleventh–twelfth centuries CE); it includes a splash-glazed bowl (Fig. 7:13) dated to the late Abbasid–Fatimid periods (tenth–eleventh centuries CE), a glazed bowl (Fig. 7:14) from the mid-twelfth–thirteenth centuries CE and a casserole from the eleventh–early twelfth centuries CE (not drawn). In the Crusader period the hall was paved with stone slabs, a few of which were found in the western square (L6; Fig. 18). 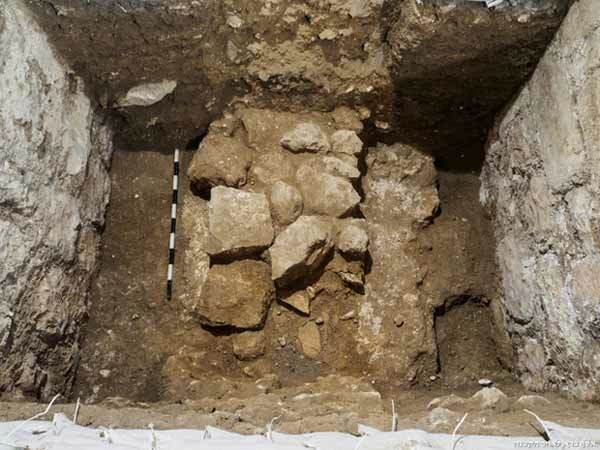 A bedding composed of small fieldstones was found beneath the floor. Six ashlar-built pillars (W33–W38) were found in the courtyard bordering Hall 1 on the south; many of the ashlars bore diagonal dressing and masonry marks (Fig. 14:6–9). The pillars were apparently part of the cloister and probably date from the Crusader period (Figs. 19, 20). The building complex, which includes the lower floor and the church, combines two different architectural styles. The lower floor is built of medium-sized stones that are roughly dressed, whereas the church on the upper floor is characterized by meticulous ashlar construction. The differences in building styles may represent construction phases in the Crusader period. It is also possible that the ground floor was built as a crude and massive structure, as it was meant to serve as a supporting basement for the upper floor (Fig. 21). Stratum II (Ayyubid–Mamluk periods; twelfth–fifteenth centuries CE). A layer of gray soil and small fieldstones (L11) was unearthed at the level of the Stratum III floor, as this floor was probably plundered. The level of the floor was raised with a second soil fill (L1, L10; Fig. 15). Fill 11 yielded two copper coins: A fals minted under the Ayyubid ruler of Aleppo, al-Zahir Ghazi (1186–1216 CE; IAA 161139) and a worn Mamluk fals dated to the late fourteenth or the early fifteenth century CE (IAA 161140). Fill 10 yielded glazed bowls decorated with Byzantine fine sgraffito (Fig. 7:15, 16), dating from the twelfth–early thirteenth century CE and a glazed Aegean Ware bowl (Fig. 7:17) from the mid-twelfth–early thirteenth centuries CE. 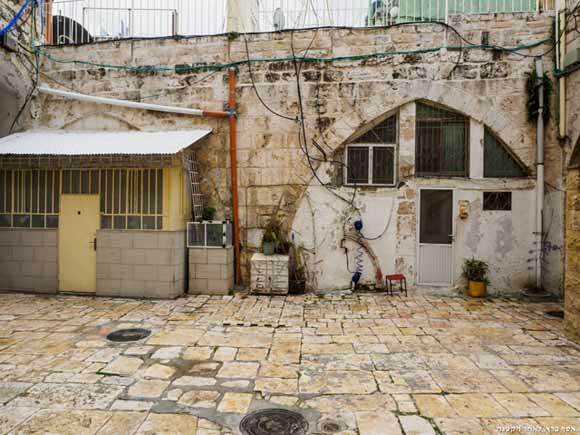 The absence of ceramic finds from the Mamluk period onward is probably due to the removal of layers and fills by the owner of the property prior to the excavation. Stratum I (modern period; twentieth–twenty-first centuries CE). The floor was apparently raised to its current level with fills; these fills were apparently removed by the owner of the property prior to the excavation. During this period, Opening ‘b’ and the west facade (d) were blocked with brick walls (W16, W19) and Opening ‘a’ was narrowed to form a small entrance. 1. The eastern part of Hall 1 was blocked by a wall (W21) built of medium-sized dressed stones that abuts to some degree the walls of the hall and the Stratum III vault. It therefore seems that Wall 21 is either contemporary with the hall or later than the hall (Fig. 22). 2. A niche was installed in W15 of Stratum III, and a window was cut through the wall above it (e; Fig. 4: Section 2–2). 3. Opening ‘a’ underwent two changes: the original arch was breached, and the opening was raised by constructing an additional arch (f; Fig. 4: Section 2–2) and then narrowed by inserting stones on the outer side of the structure. 4. 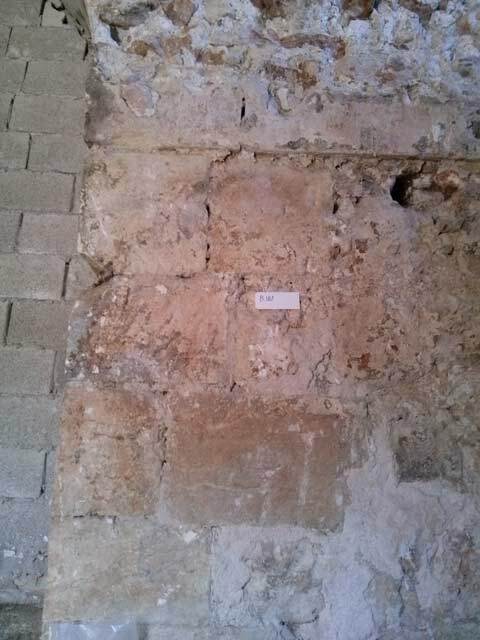 While unearthing the walls of the building and the vault of Stratum III, numerous pieces of wood were found wedged between the building stones (Fig. 23) and mixed in the bonding material. They are probably part of the original Crusader-period structure or from a later Medieval addition. In any case, they are of a Medieval date and not modern. Mural. The eastern part of the church was the originally built in the Crusader period; the walls of the apse up to the top course (cornice) are part of this original structure. The domes springing from the walls are a later addition; they were built in the Ottoman period, as the Crusader domes did not survive. Today, the entrance to this sacred part of the church is forbidden, and access to the apses is difficult because a modern iconostasis separates the nave from the eastern part of the church. 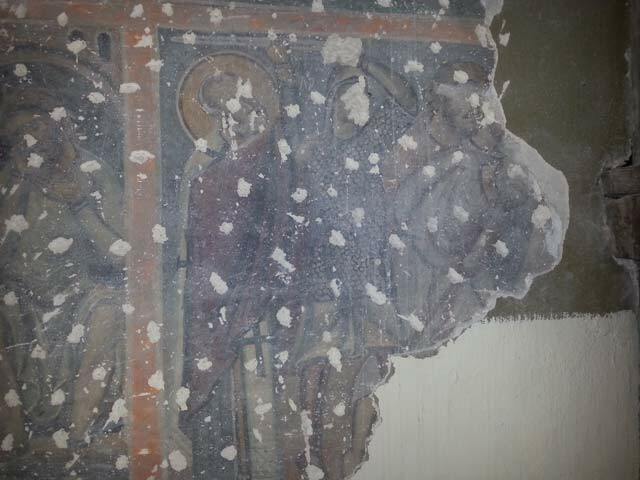 In a one-time visit to the southern apse, made possible during the excavation, the local clergy informed the excavators that part of a mural depicting the life of St. Nicholas was revealed a few years ago on the southern wall, when several layers of plaster that had accumulated over the past decades or centuries were removed from the walls of the apse. 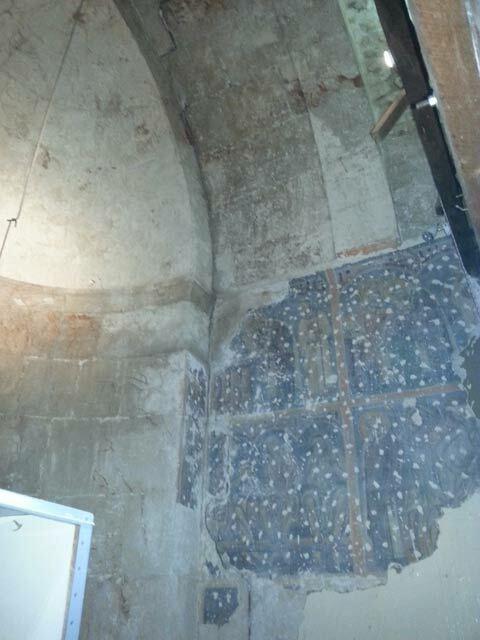 The painting occupies most of the wall and was preserved up to the cornice from which the dome of the apse springs (Fig. 24); originally, the mural probably continued into the dome, but it was eventually destroyed and replaced. 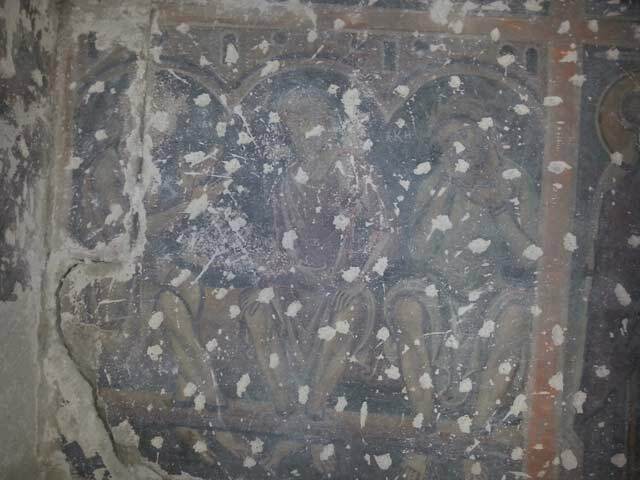 The painting and the plaster layer beneath it are pitted with holes and numerous deliberate gashes in the plaster made in preparation for applying subsequent layers of plaster and attaching them to the earlier, painted layer of plaster. The mural is divided into four separate panels framed with red borders (Fig. 25): in the upper left panel, Nicholas is portrayed administering mass (Fig. 26); in the upper right panel, Nicholas is ordained as bishop (Fig. 27); in the lower left panel, three imprisoned generals are waiting to be executed by the Romans for confessing to be Christians (Fig. 28); and in the lower right panel, Nicholas is intervening to save the three innocent generals just as they are about to be beheaded (Fig. 29). The iconography is Byzantine and depicts well-known scenes in the Byzantine cycles of St. Nicholas’s life (Sevčenko 1983). One such example is a Byzantine icon from Santa Katarina in the Sinai, dated to the twelfth century CE (Patterson 1983:29–30, Pl. 3). The iconography of St. Nicholas is less common in the West in the twelfth–thirteenth centuries CE; examples are found in the southern portal of Chartres Cathedral and in its stained-glass windows, which depict scenes from his life (Clare 1985:117). 1. 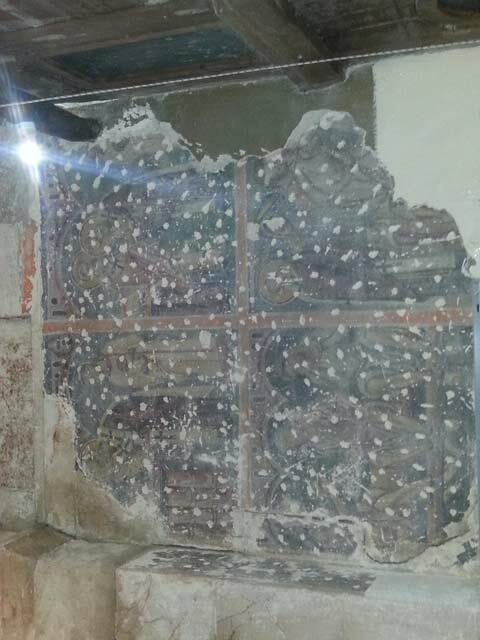 Of the Crusader church, only the lower parts of the walls of the apses were preserved, and the remains of the mural are found only in the lower part of the south apse. 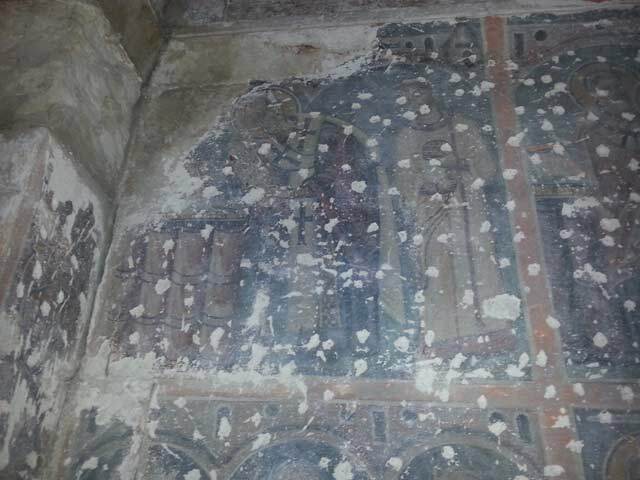 No traces of murals were found elsewhere in the church, which was restored in the Ottoman period. 2. The mural is applied directly onto stones exhibiting the characteristic diagonal dressing of Crusader masonry and was sealed by layers of plaster and paint deposited over it for centuries. 3. 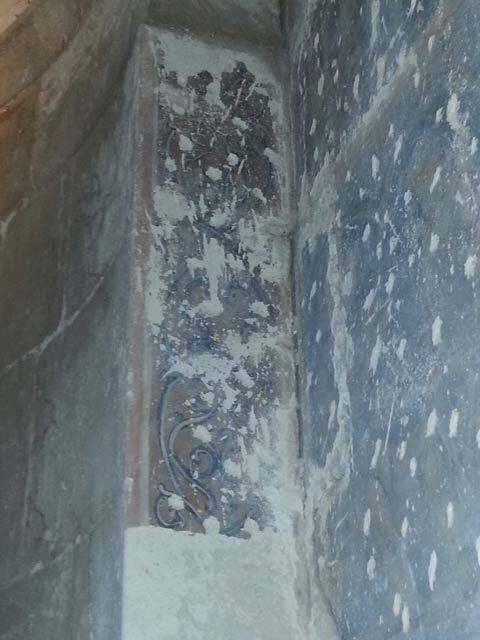 On the lintel of the apse wall, bordering on the painting, is a mural with a vegetal decoration (vine leaves? Fig. 30) that is closely resembles a design on the stones of a Crusader voussoir at Crac des Chevaliers (Folda, French and Coupel 1982:181). 4. The red frame bordering the registers resembles frames found in wall frescoes at Abu Gosh and Gethsemane (Seligman 2012; Fishhof 2017). 5. The architectural details of arches and buildings painted in the background of the figures are typical of those depicted in Crusader paintings and sculpture, such as those depicted in the sculpted lintels of the portal at the Church of the Holy Sepulcher (Kenaan-Kedar 1999:181–182). 6. The executioner’s armor is made of chain mail, which is typical of the Crusader period. The excavation unearthed the remains of a Byzantine building that was probably already destroyed and plundered during the Byzantine period, possibly due to the Persian conquest. Hall 1 was dated to the Crusader period based mainly on architectural analysis and on the style of masonry. At this stage of the research, it is difficult to ascertain the purpose of this space. It probably provided retaining vaults for supporting the upper floor; these were used for storage and as dwellings. It may have also served as a crypt that was accessed from the church on the upper floor. The pillars examined to the south of the church exhibit architectural characteristics typical of the Crusader period and should therefore be interpreted as part of the cloister to the south of the church building. Alterations made in the Ayyubid or Mamluk periods are evident mainly in the raising of the floor level. Changes were made again in the Ottoman period, as the church was rebuilt on the upper floor. 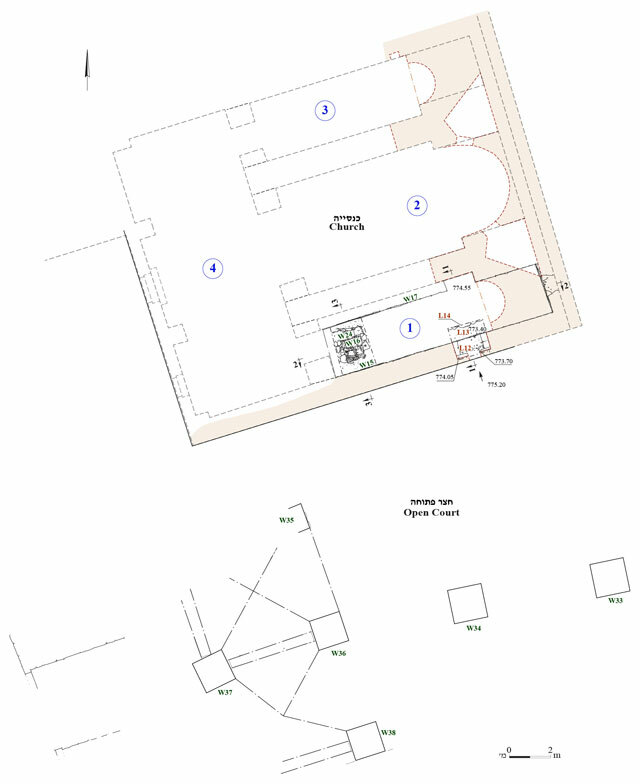 Full documentation of the lower floor (where the Greek Patriarchate Museum is located) is being conducted in order to create a complete picture of both floors of the architectural complex. The bonding material will also be analyzed, and samples of the wooden fragments will be dated by Carbon-14 analysis. 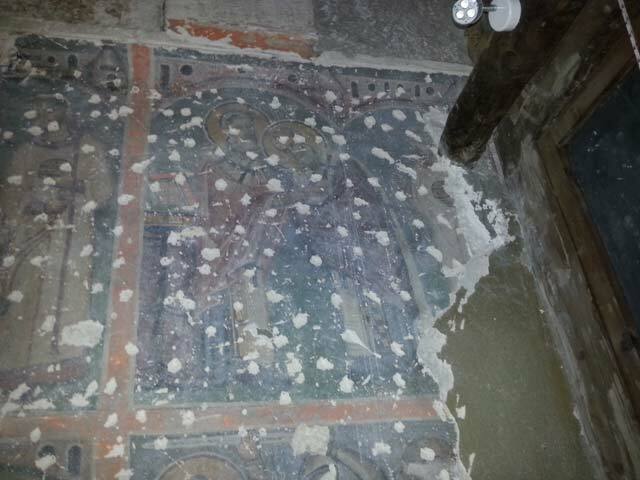 If permission is granted to access the magnificent mural in the church, further investigation will allow for more precise conclusions and provide better dating. Abel F.M. 1923. Chronique: Une crypte byzantine à Beit Djala. RB 32:267–272, Pl. VI. Clare E. 1985. St. Nicholas: His Legends and Iconography (Pocket Library of Studies in Art 25). Florence. English A.C. 2012. The Saint Who Would Be Santa Claus. Waco, Tex. Fishhof G. 2017. Hospitaller patronage and the mural cycle of the Church of the Resurrection at Abu-Ghosh (Emmaus) – a new reading. In J. Schenk and M. Carr eds. Culture and Conflict in the Mediterranean World (The Military Orders 6/1). Oxford. Pp. 82–93. Folda J., French P. and Coupel P. 1982. Crusader Frescoes at Crac des Chevaliers and Marqab Castle. Dumbarton Oaks Papers 36:177–210. Kenaan-Kedar N. 1999. The Two Lintels of the Church of the Holy Sepulcher in Jerusalem. In S. Rozenberg ed. Knights of the Holy Land: The Crusader Kingdom of Jerusalem (Israel Museum Catalogue 422). Jerusalem. Pp. 176–185. Pringle D. 2007. 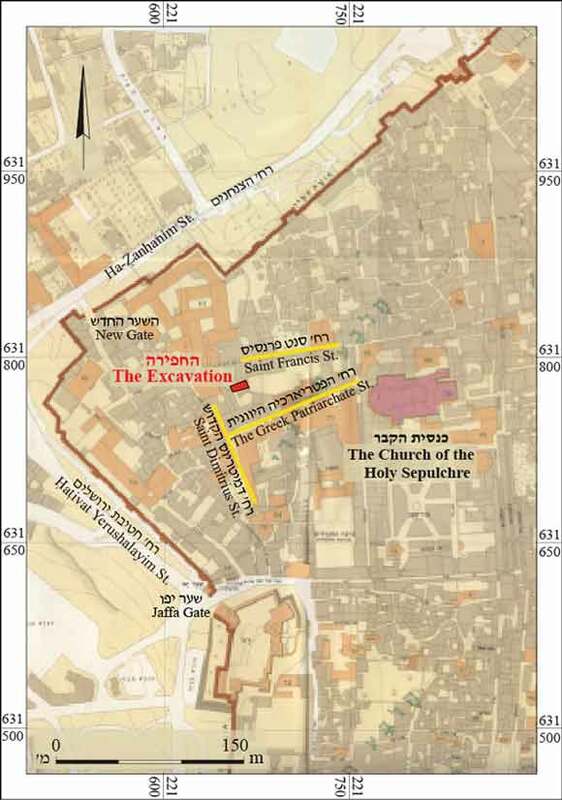 The Churches of the Crusader Kingdom of Jerusalem: A Corpus III: The City of Jerusalem. Cambridge. Seligman J. 2012. 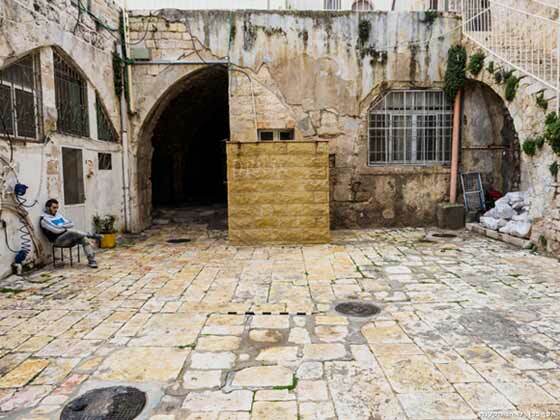 A Wall Painting, a Crusader Flood Diversion Facility and other Archaeological Gleanings from the Abbey of the Virgin Mary in the Valley of Jehoshaphat, Jerusalem. In L.D. Chrupcala ed. Christ Is Here! Studies in Biblical and Christian Archaeology in Memory of Michele Piccirrillo, OFM (SBF Collectio Maior 52). Milan. Pp. 185–220. Sevčenko P.N. 1983. The Life of Saint Nicholas in Byzantine Art. Turin. 2. 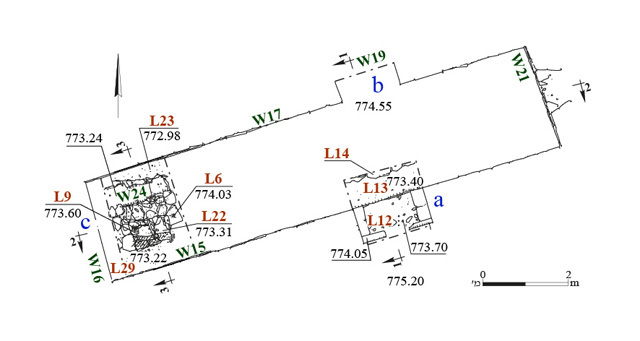 Plan of the Crusader church and the ground floor with location of the excavation squares. 3. Plan of excavation squares. 5. Western excavation square, section, looking east. 6. Mosaic Floor 22, looking west. 11. Stone fill (L9), looking west. 12. General view of Hall 1 with Passage ‘c’ in background blocked by W16, looking west. 13. Passage ‘b’ blocked by W19, looking north. 15. Entrance ‘a’, looking south. 16. Transverse supporting arch in W17, looking northwest. 17. Foundations of church walls cutting into earlier strata, looking east. 18. Remains of stone-slab floor (L6). 19. Western part of the open courtyard, looking west. 20. Southern part of the open courtyard, looking south. 21. The church building, southern facade, looking north. 22. Wall 21, looking east. 23. Pieces of wood inserted in the vault of the Crusader hall, looking north. 24. Mural in the southern apse. 26. Upper left panel, Nicholas administering mass. 27. Upper right panel, Nicholas being ordained as bishop. 28. Lower left panel, the three generals in prison. 29. Lower right panel, Nicholas rescuing the three generals.